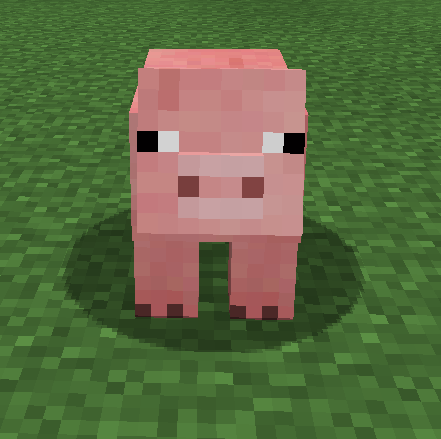 Pigs are friendly mobs that do not attack like Chickens, and can spawn on Grass in the Overworld. If killed, pigs will drop between 0-2 Raw Porkchop and 1-3 experience points. If the pig is on fire when it is killed then it will be Cooked Porkchop instead of Raw Porkchop. Pigs are also able to be used as transportation. The player will need to get a Saddle and right click a Pig with the Saddle in hand. It is wise to note that when riding a pig, the player is unable to control the movement of where the pig will go.